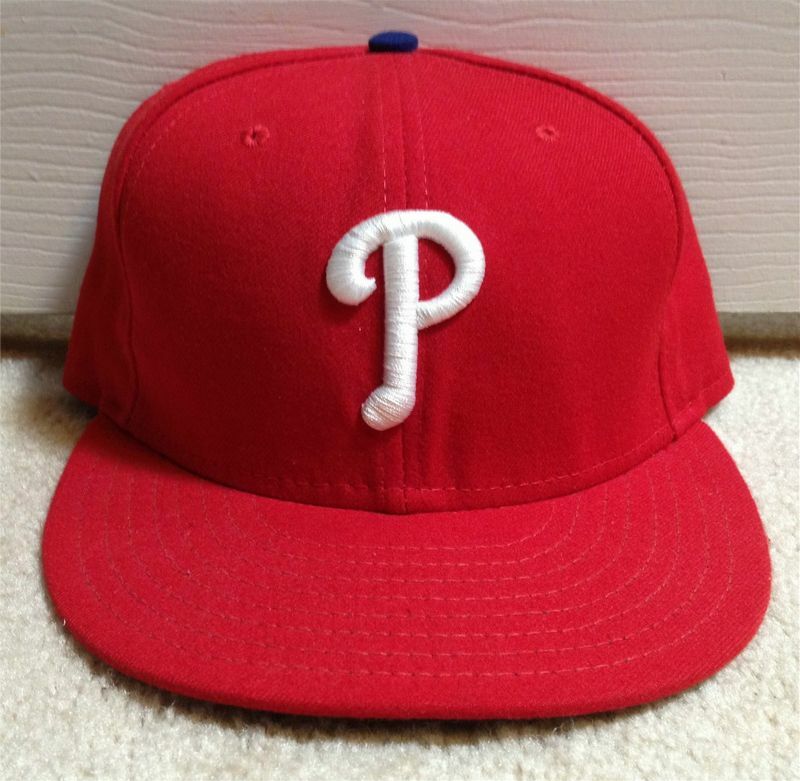 One of the original NL teams. Home caps were white, road caps navy. 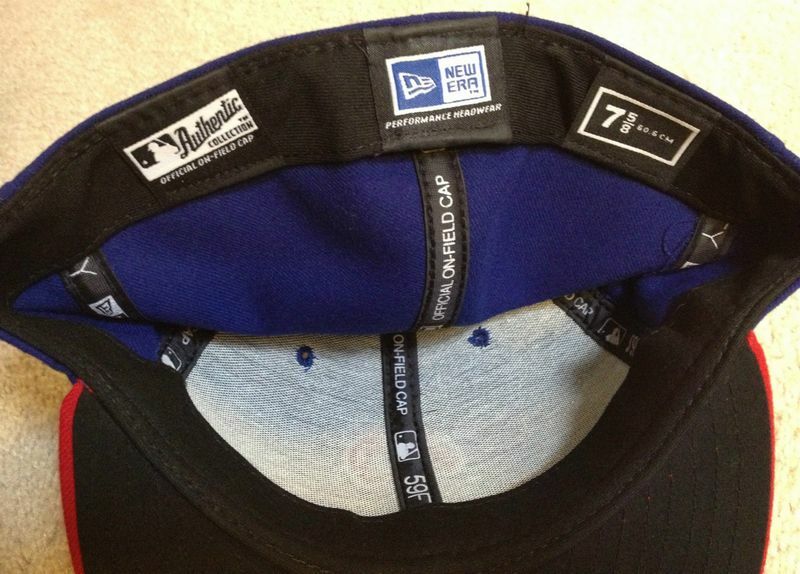 Navy caps without a logo. 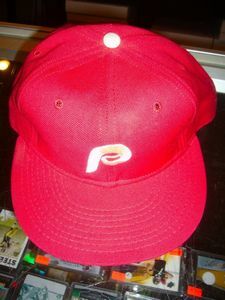 A block P logo on a white pinstriped cap for home, grey for the road. 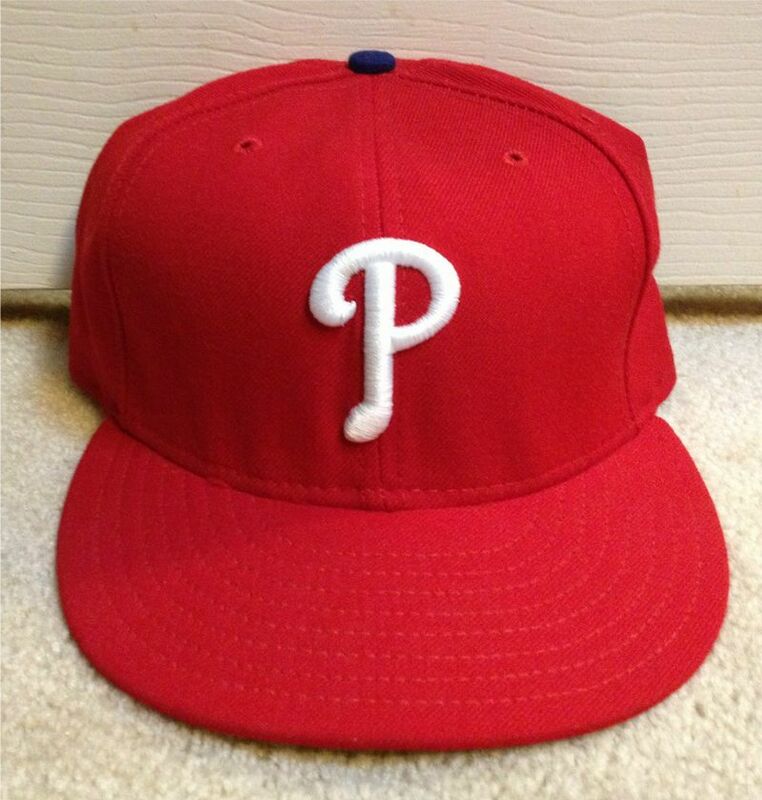 The logo goes Olde English. 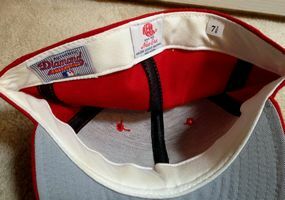 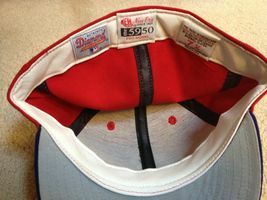 Home caps are white with red visor, road caps grey. 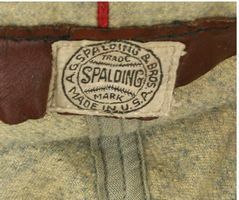 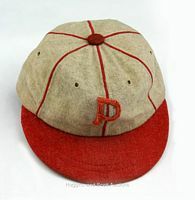 In 1926 only the road cap is navy without a logo, and in 1933 only the home cap is red with no logo. 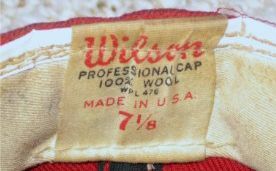 The first time the logo appears in a form close to that used today. 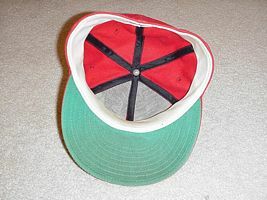 Caps are navy with a red P outlined in white. Blue caps with a gold block P.
Red replaces gold. The block P is white on home caps, red on road caps. 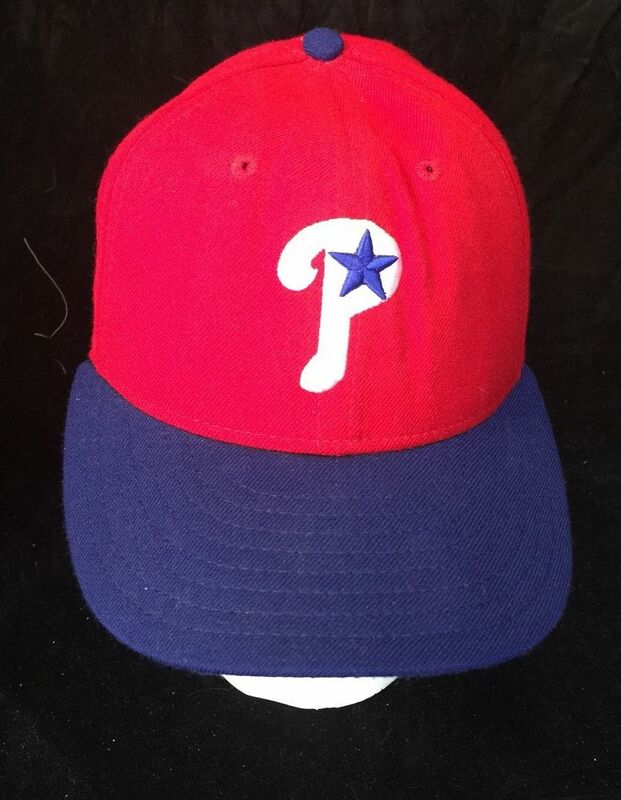 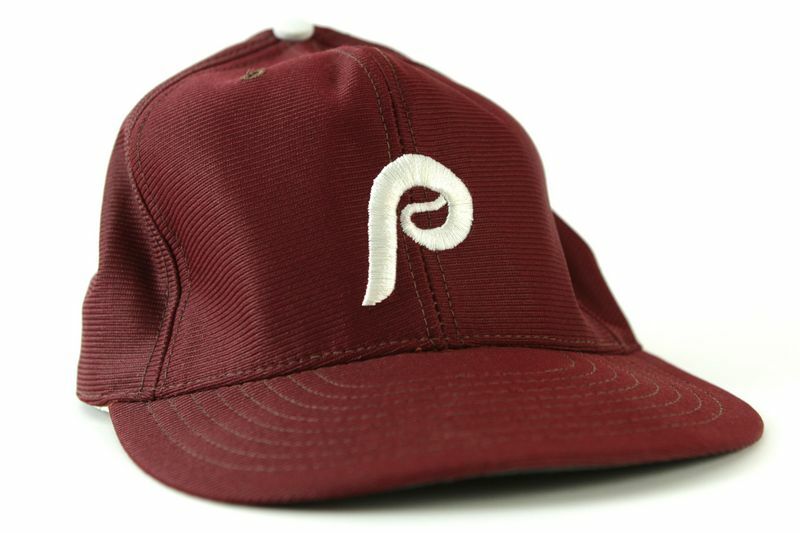 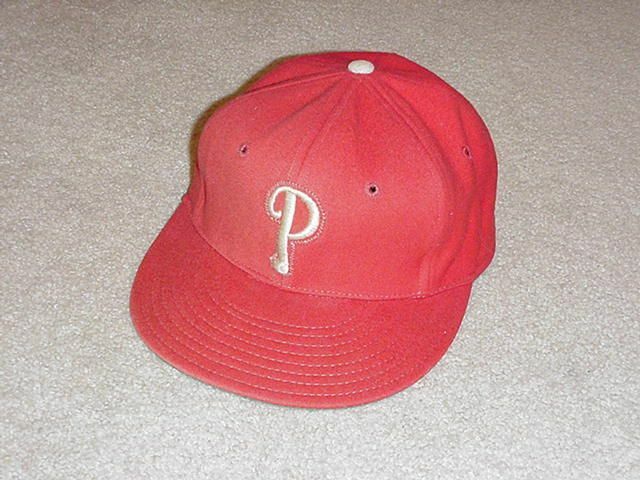 Red is dropped, caps are blue with a white block P. For one season, 1942, team President Gerald P. Nugent changed the nickname to "Phils". New owner William D. Cox changed it back to Phillies in 1943. 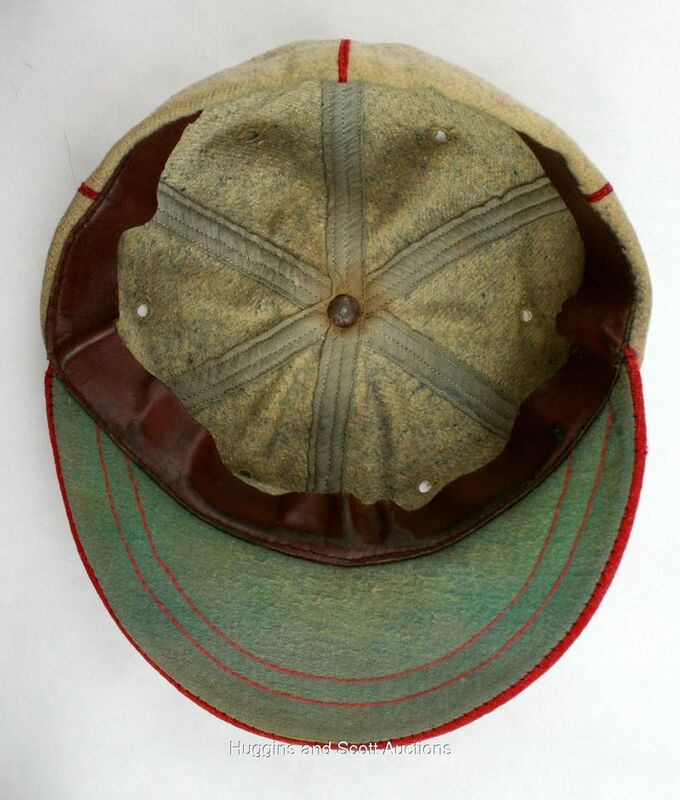 But Cox was soon banned from baseball for betting on his own team. 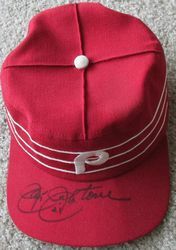 Bob Carpenter took over ownership and held a fan contest to pick a new nickname. "Blue Jays" was the winner. 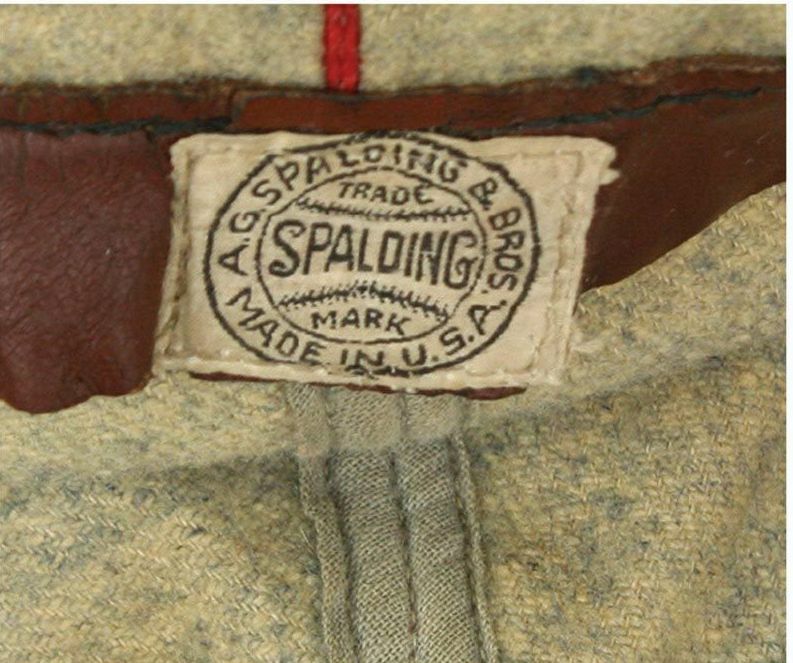 Although a blue jay patch appeared on the sleeve in 1944 and 1945, it was never officially adopted and was dropped by 1949. 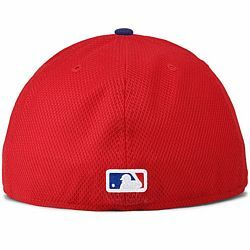 Good thing for Toronto, whose team I suppose would otherwise have been called the Toronnies. The colorway is red and navy, caps are navy with a red visor and a scripted P outlined in white. In mid season 1948, royal blue replaces navy and the scripted P logo becomes larger and straighter. 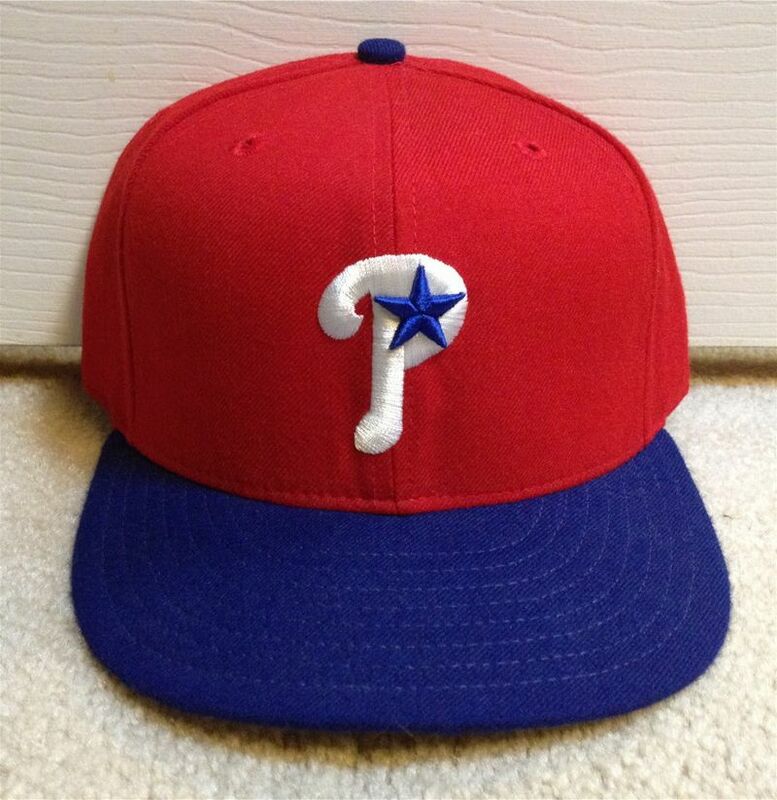 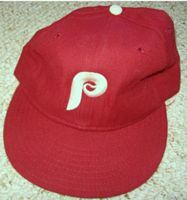 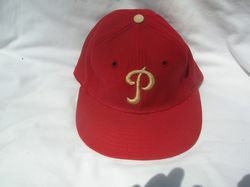 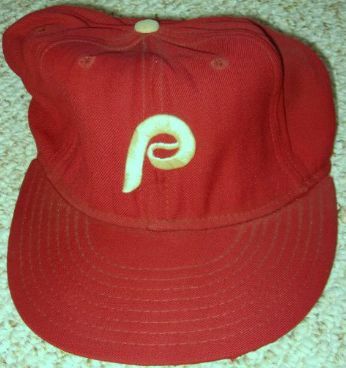 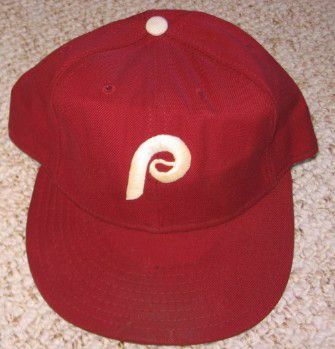 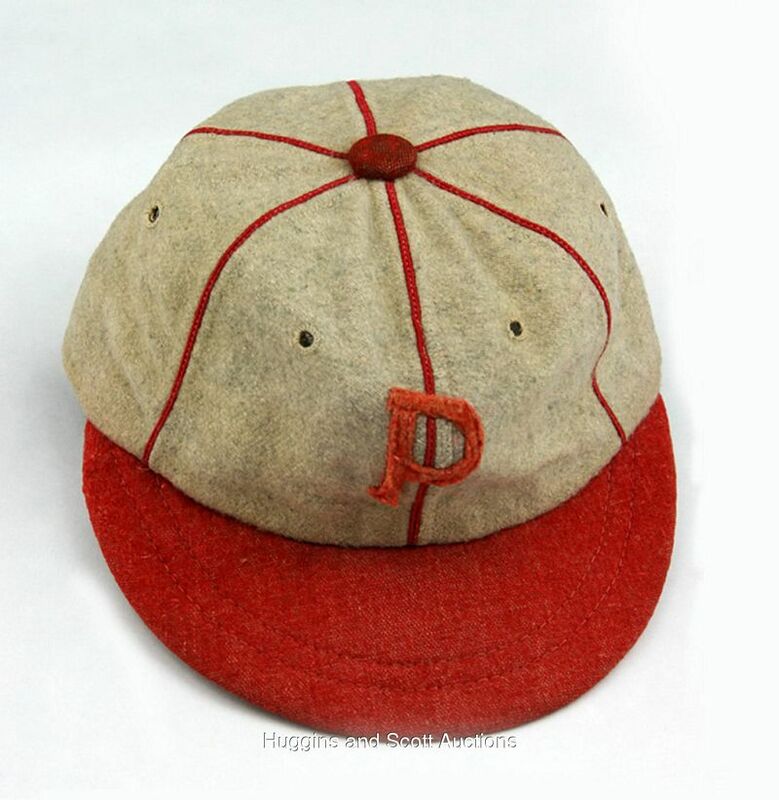 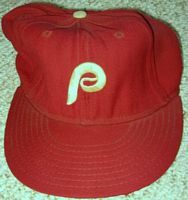 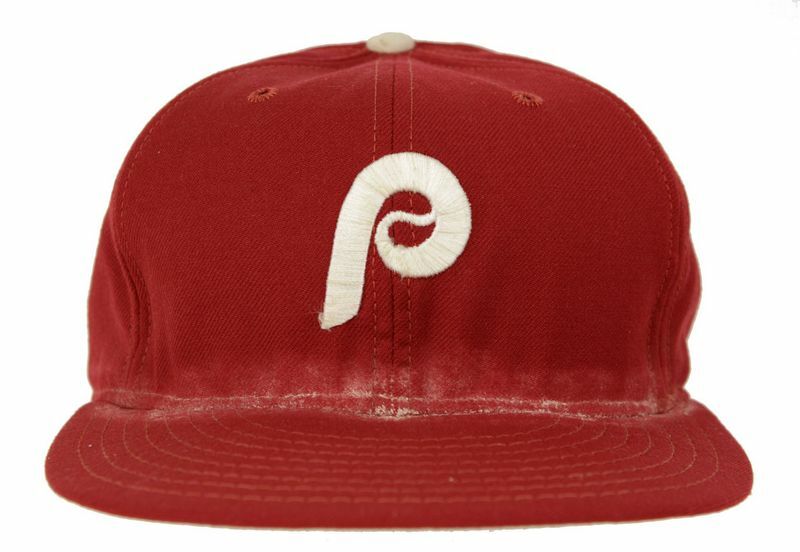 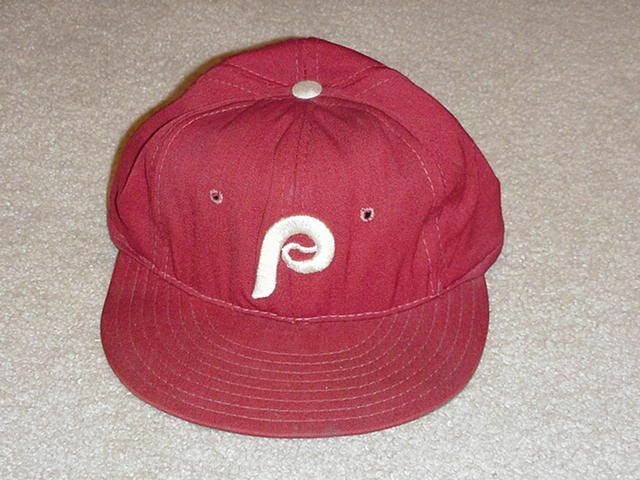 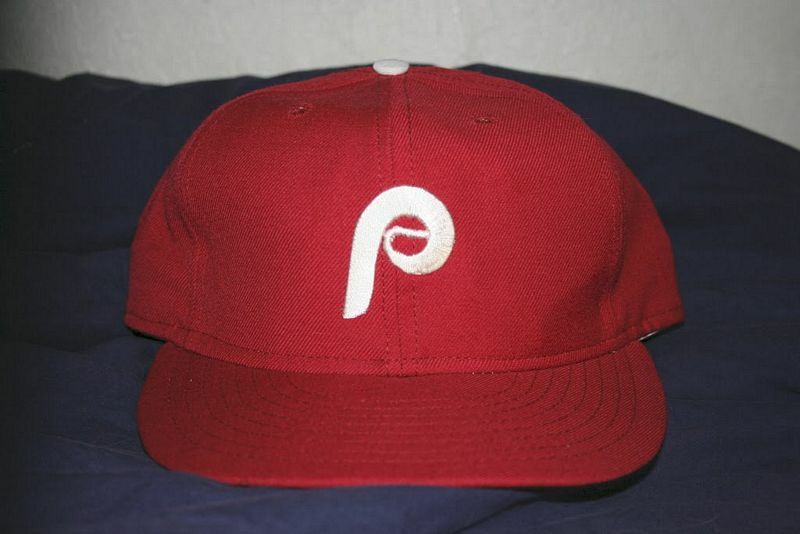 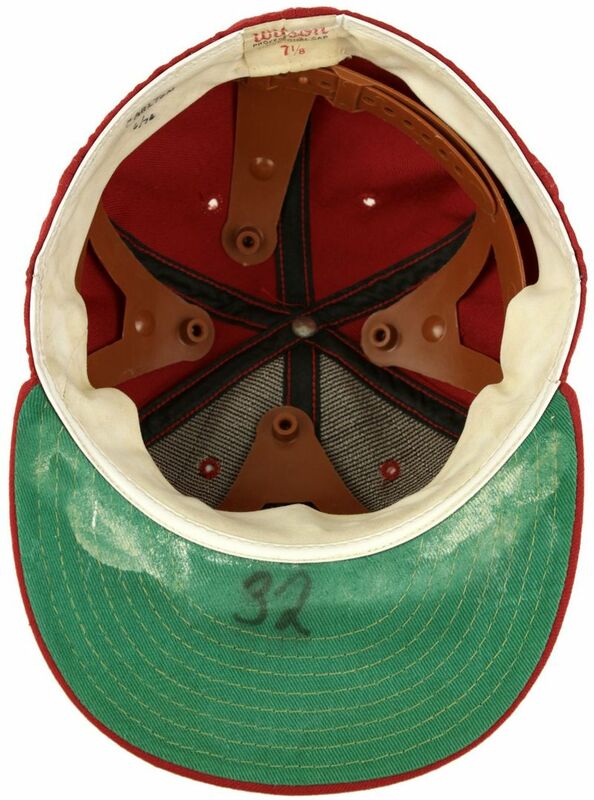 The Phils also start using McAullife caps around 1950. 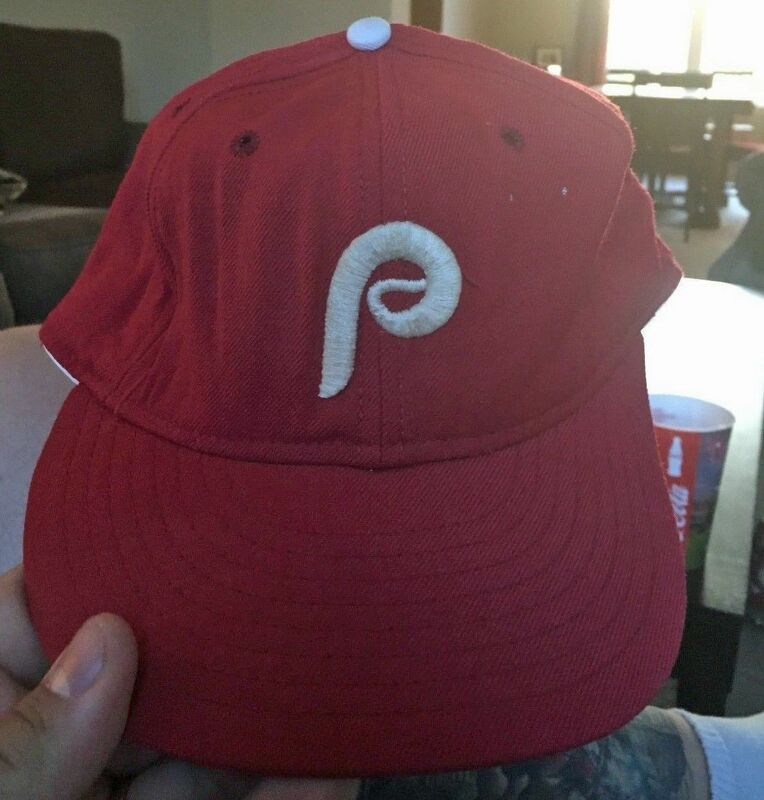 Some logos are a stitched on patch (maybe spring training?). 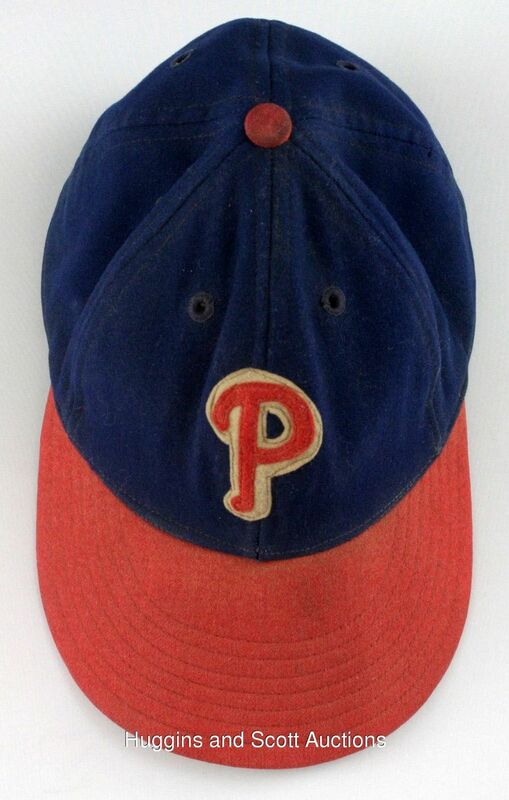 A rare McAuliffe, as the Phils mostly wore Wilson. 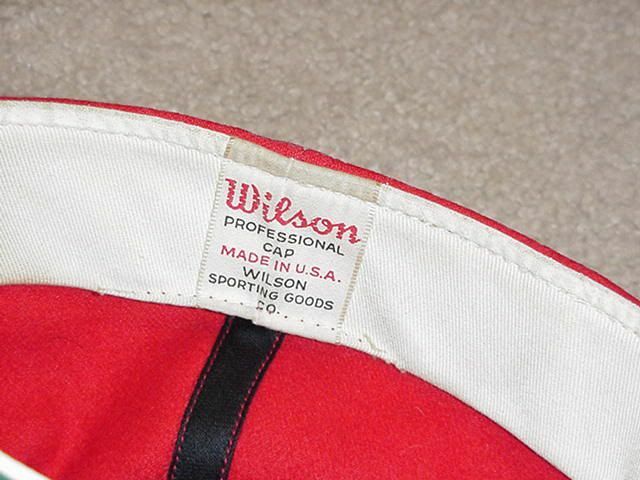 The logo becomes a P wrapped around a baseball. The red becomes burgundy. 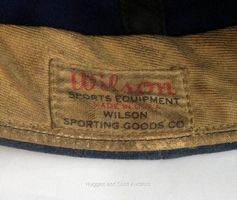 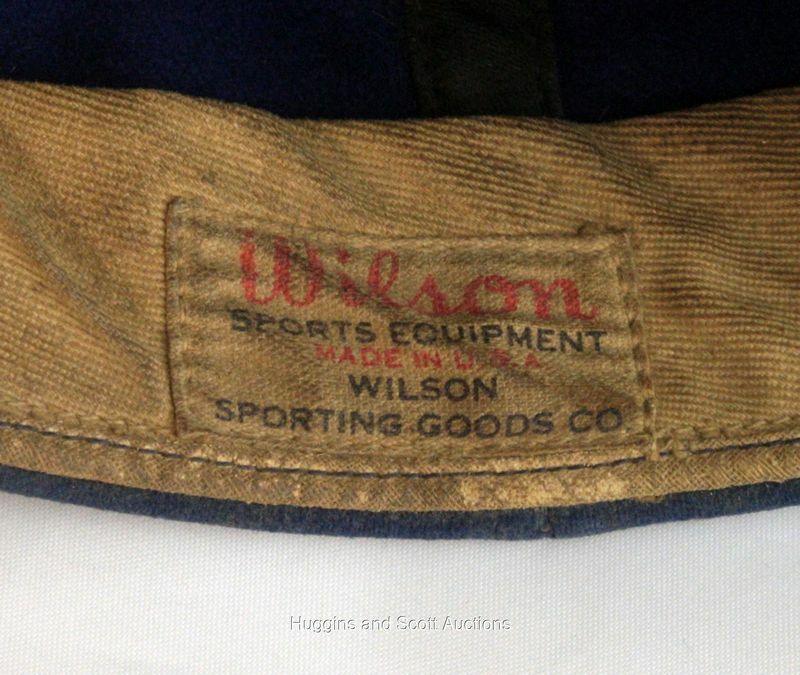 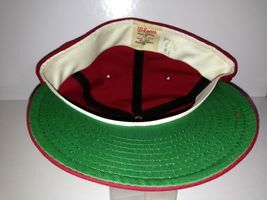 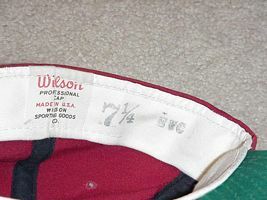 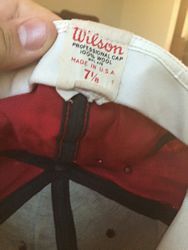 Wilson caps are made by American Needle starting around 1974-75. A pillbox cap is worn on occasion in the 1976 bicentennial year. 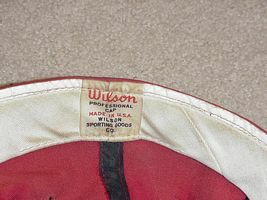 Both Wilson and New Era are used. 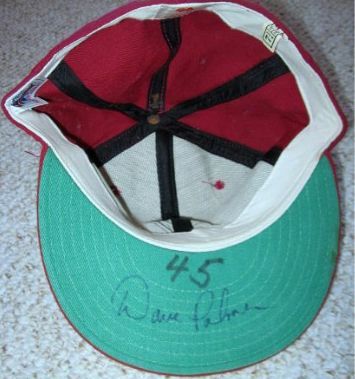 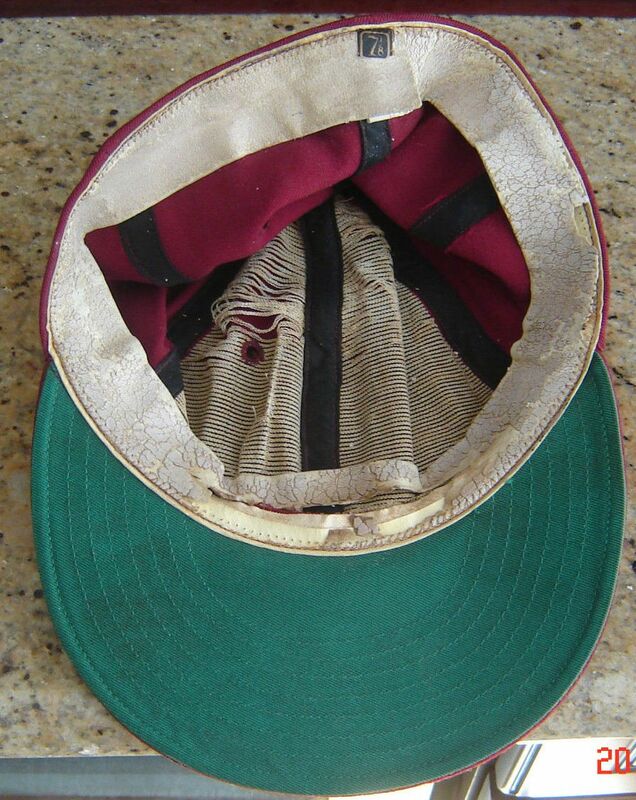 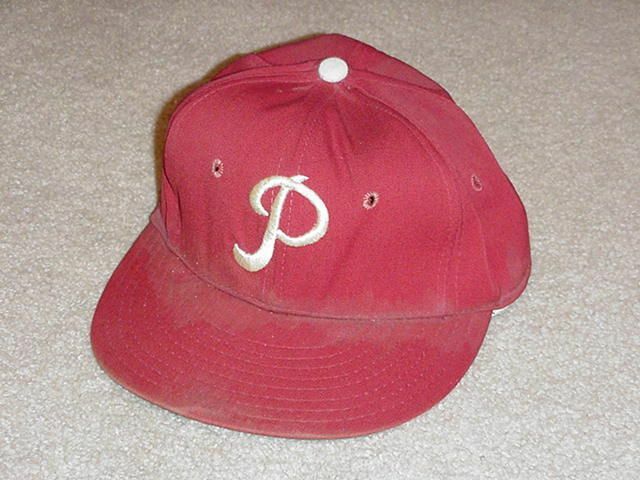 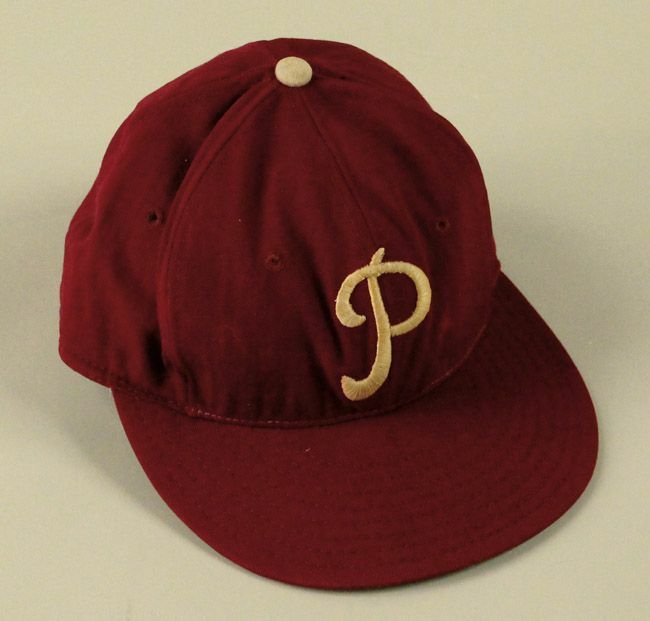 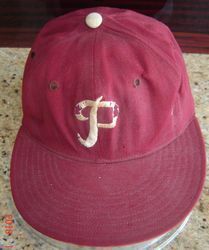 This maroon nylon cap is only worn once with the all-maroon alternate jersey that gets retired after a single game. 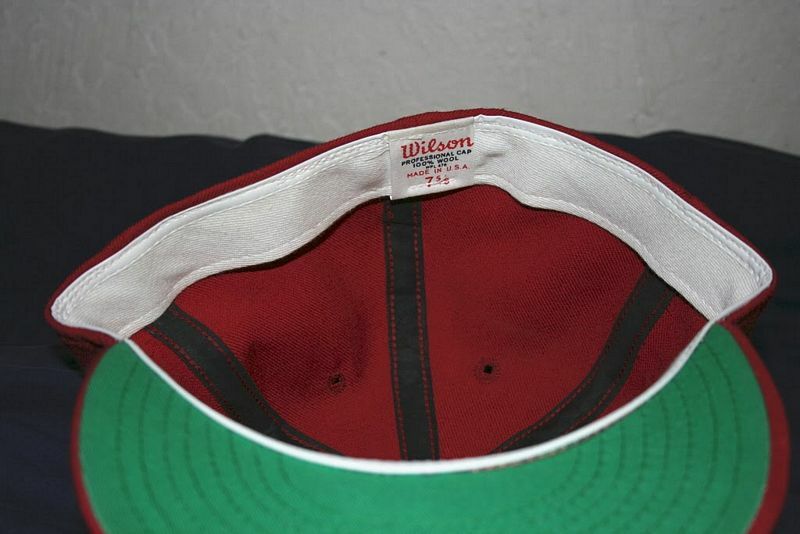 The Phillies are Wilson's last MLB customer, and in 1988 New Era takes over. Their logo is slightly less slanted. Grey undervisors are adopted in 1990. 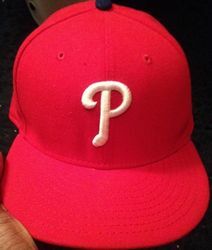 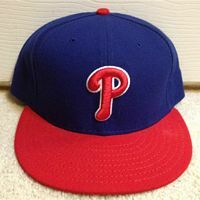 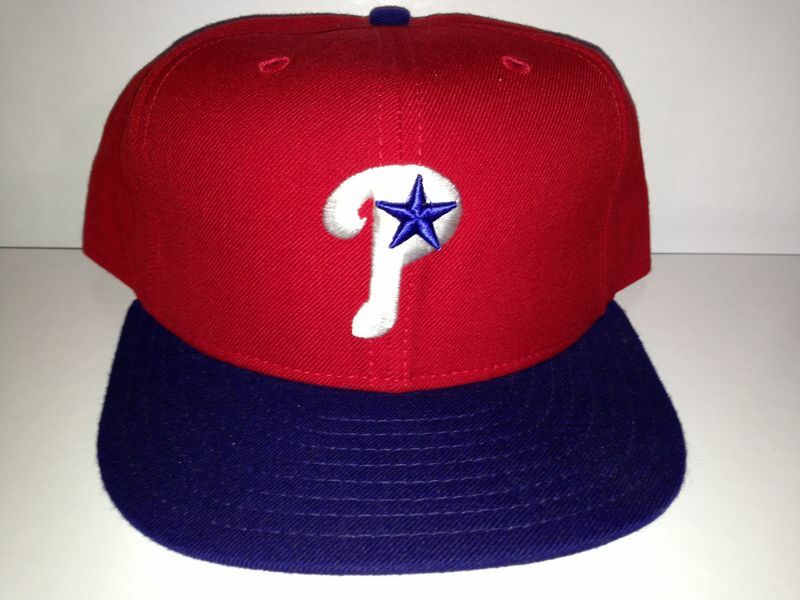 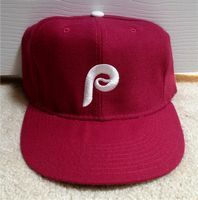 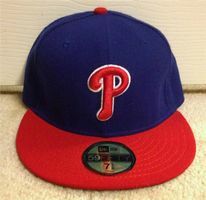 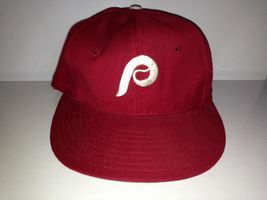 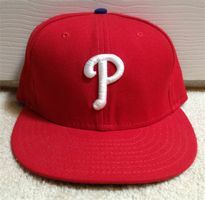 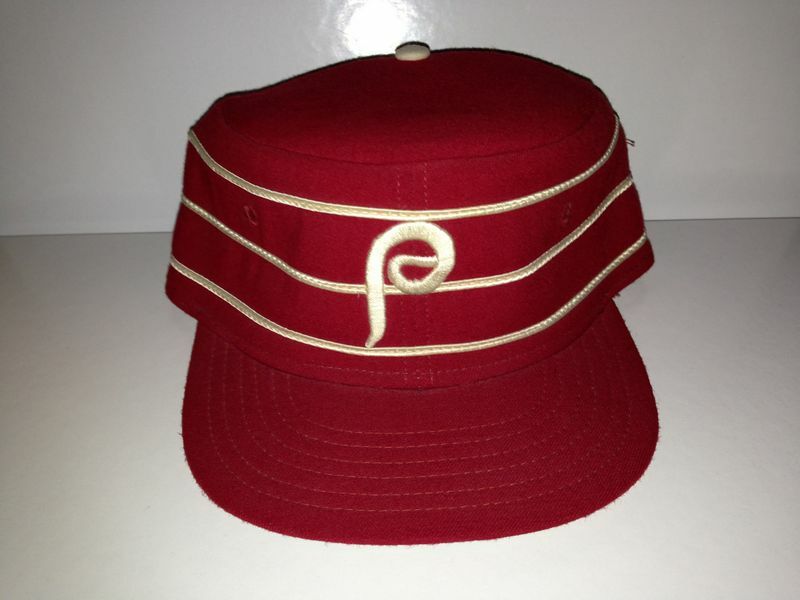 The Phillies bring back their late 40's style and colors. 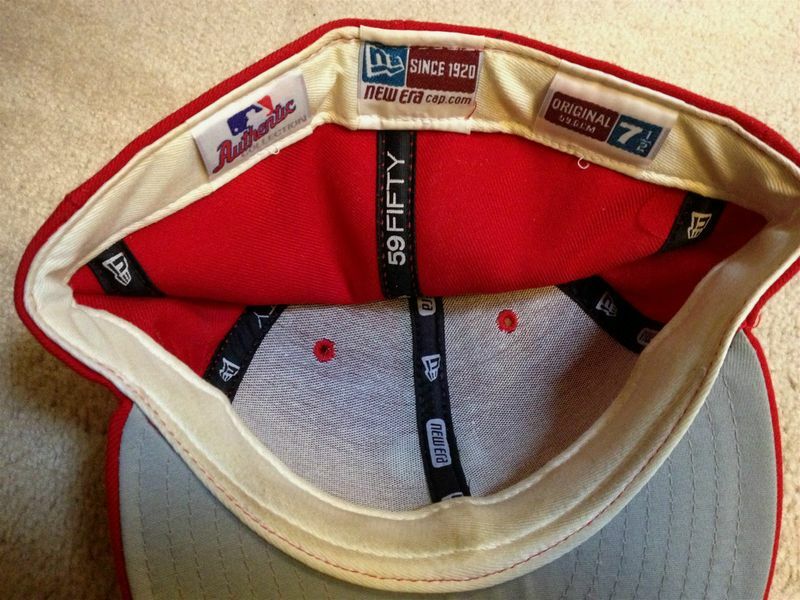 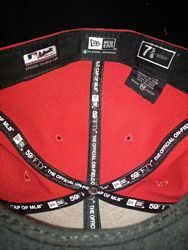 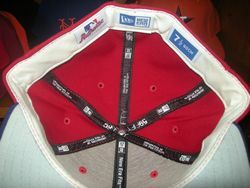 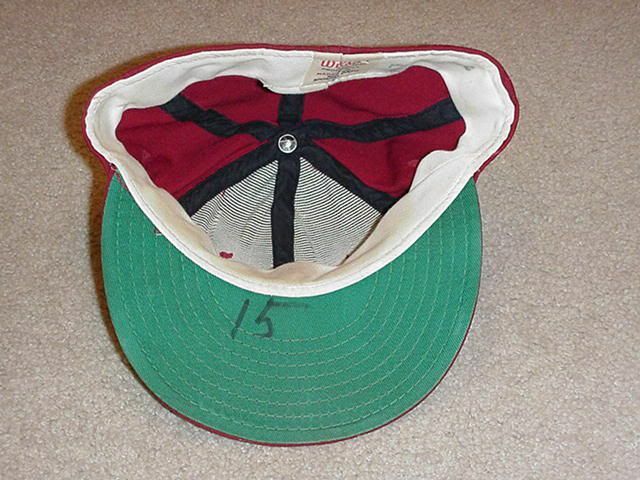 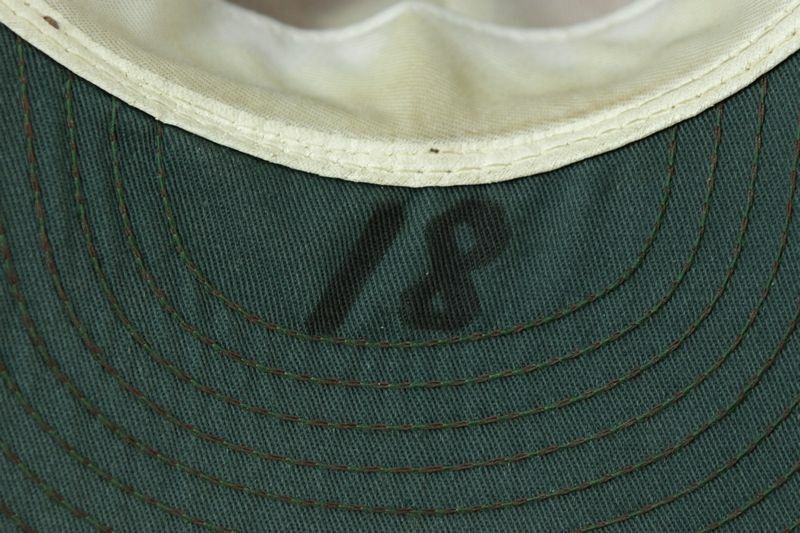 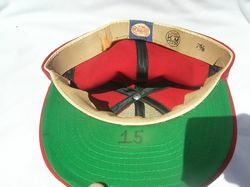 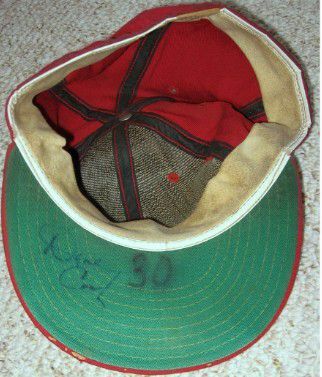 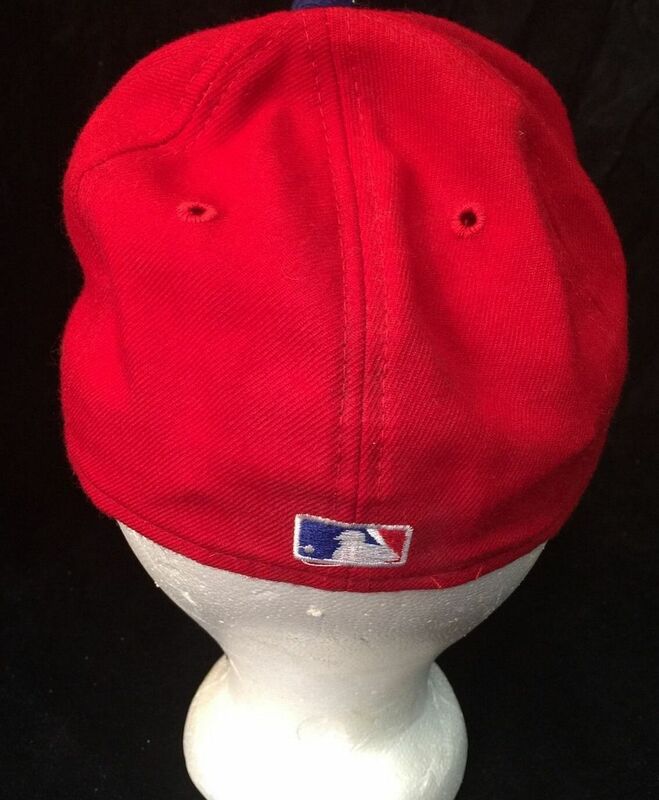 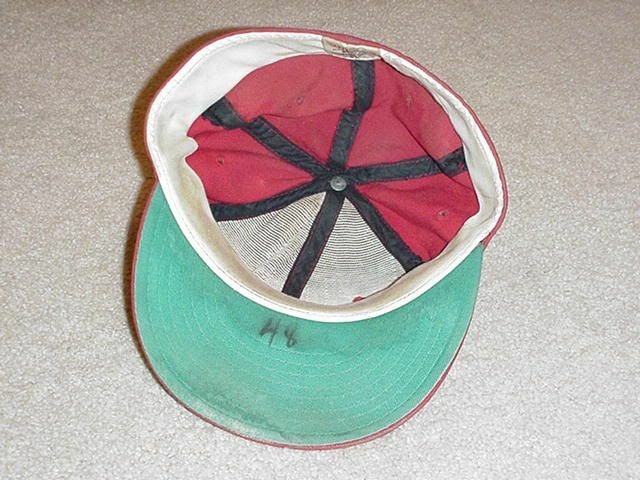 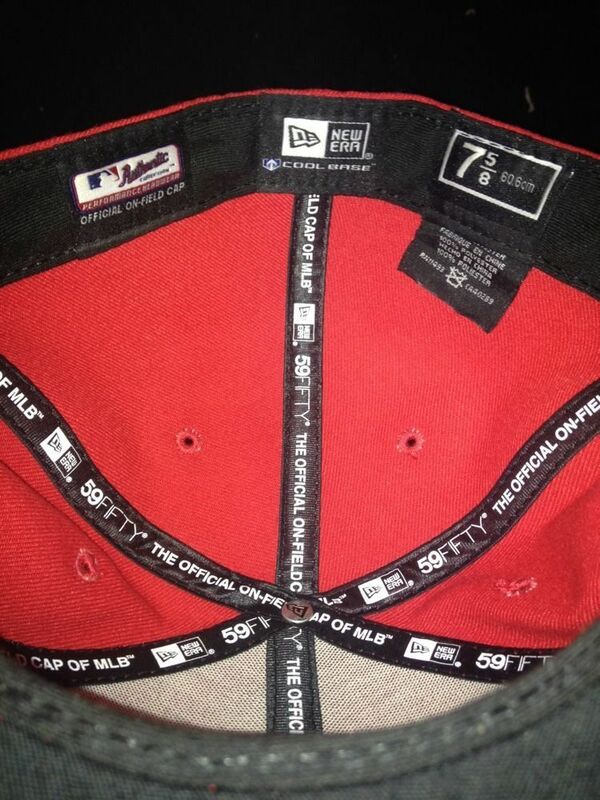 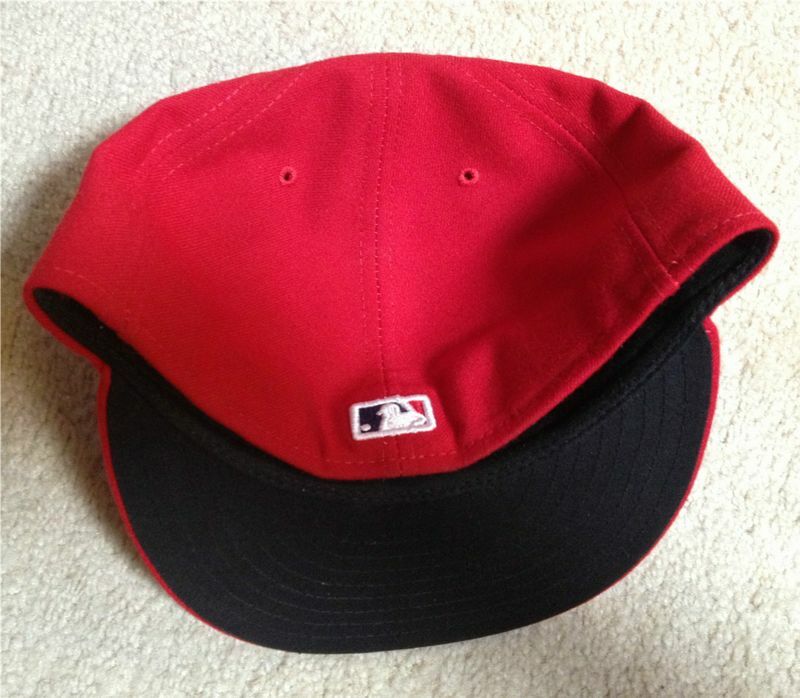 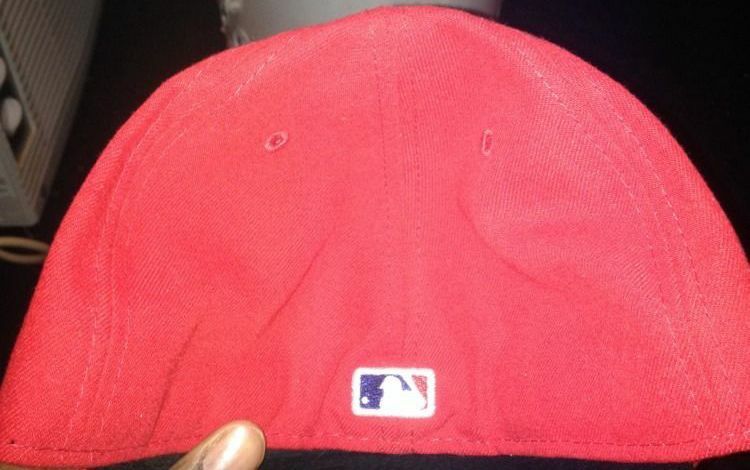 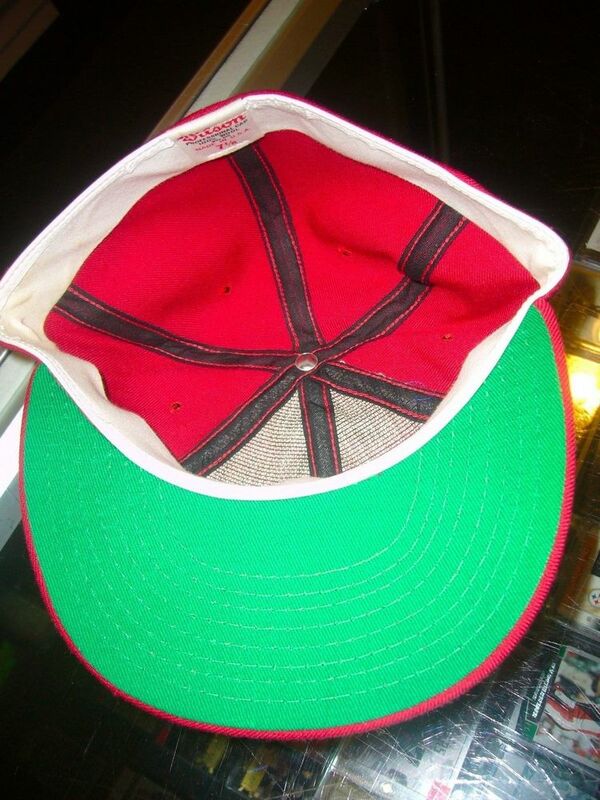 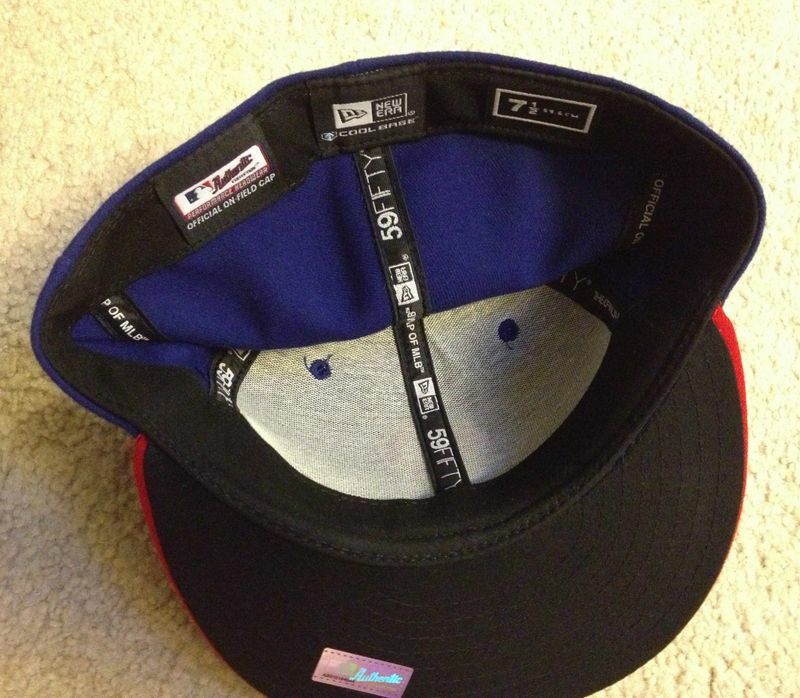 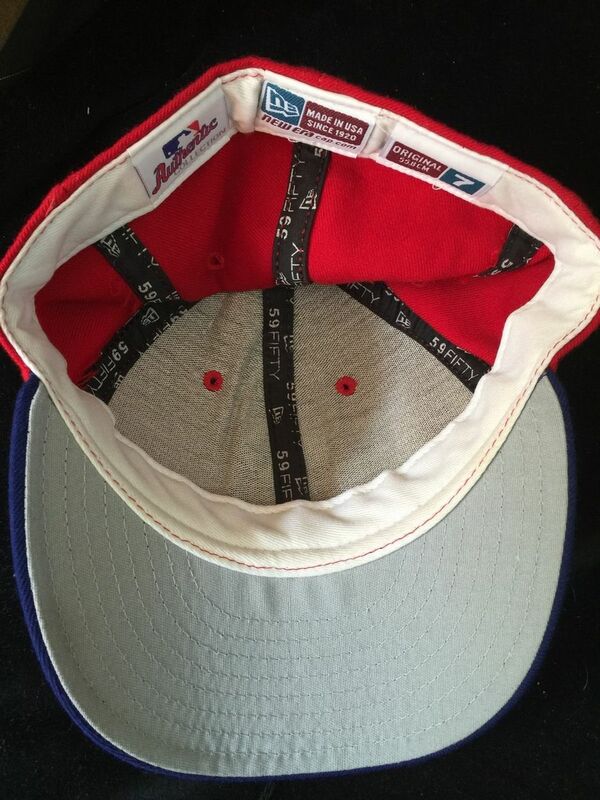 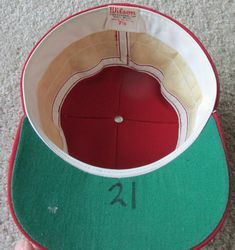 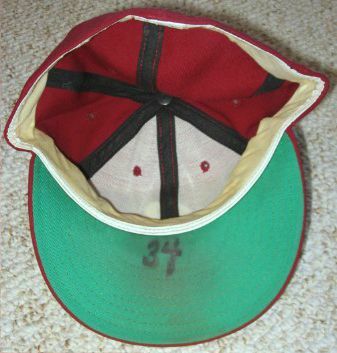 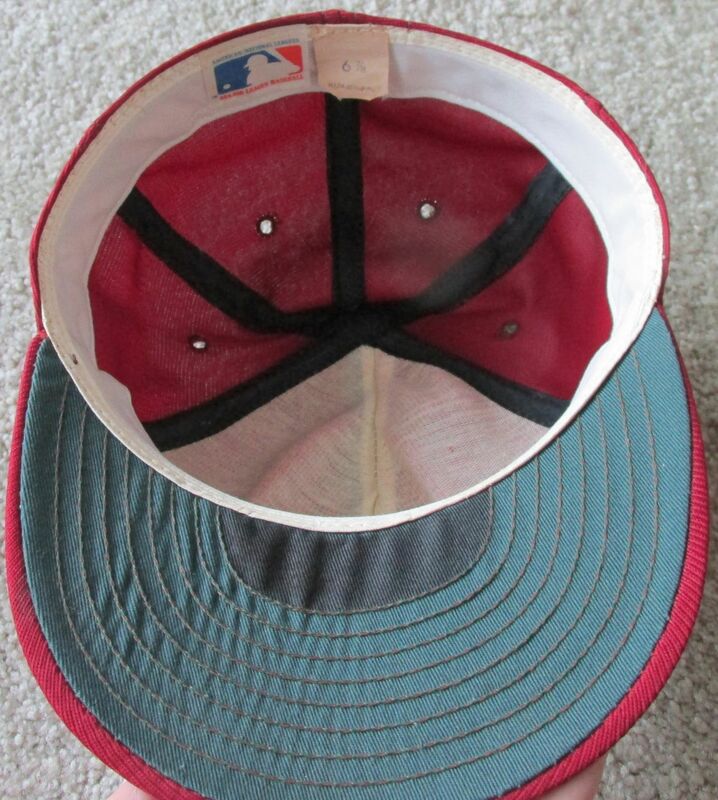 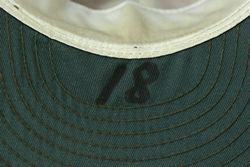 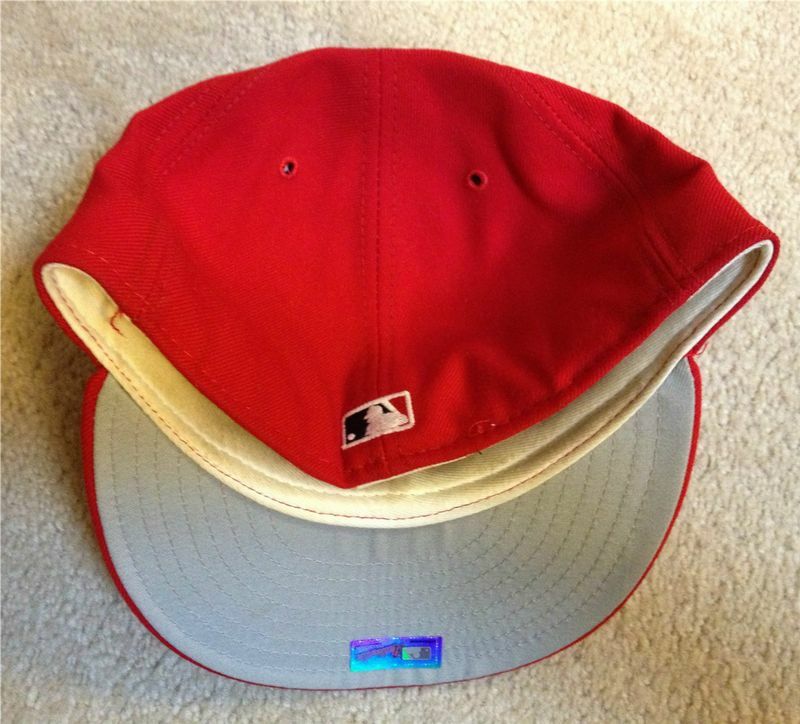 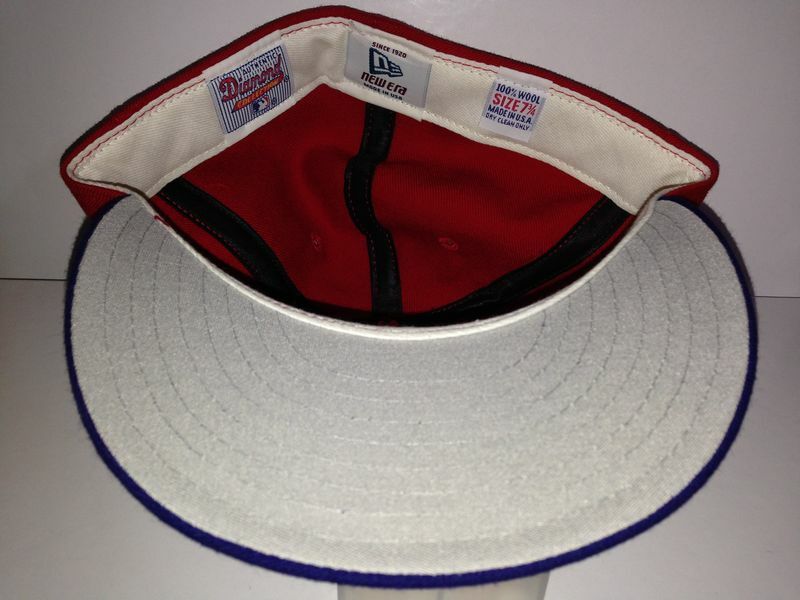 MLB logos are glued onto cap backs in 1992, thereafter they are embroidered. 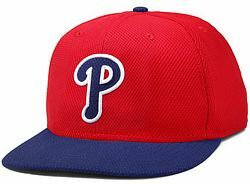 The Phillies try Sports Specialties. 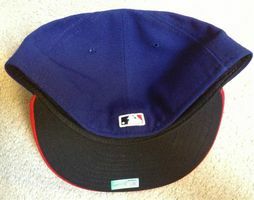 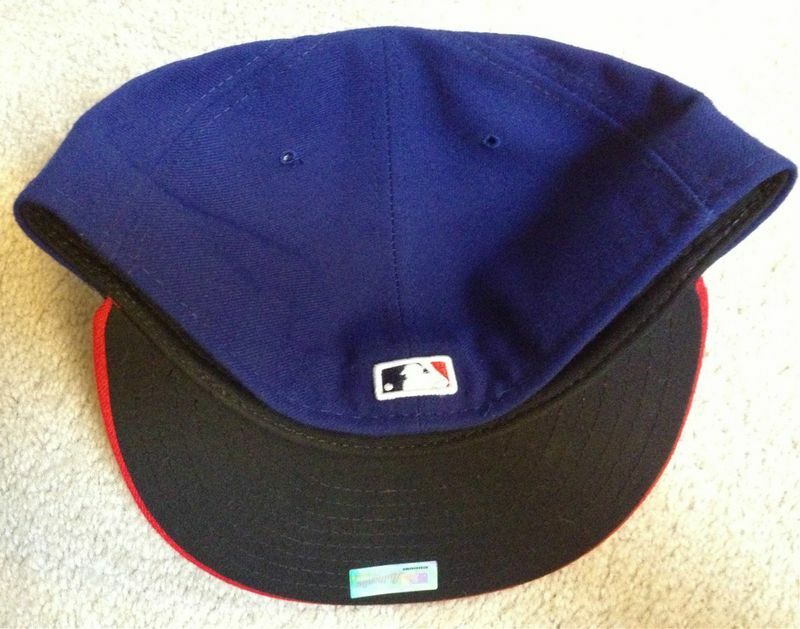 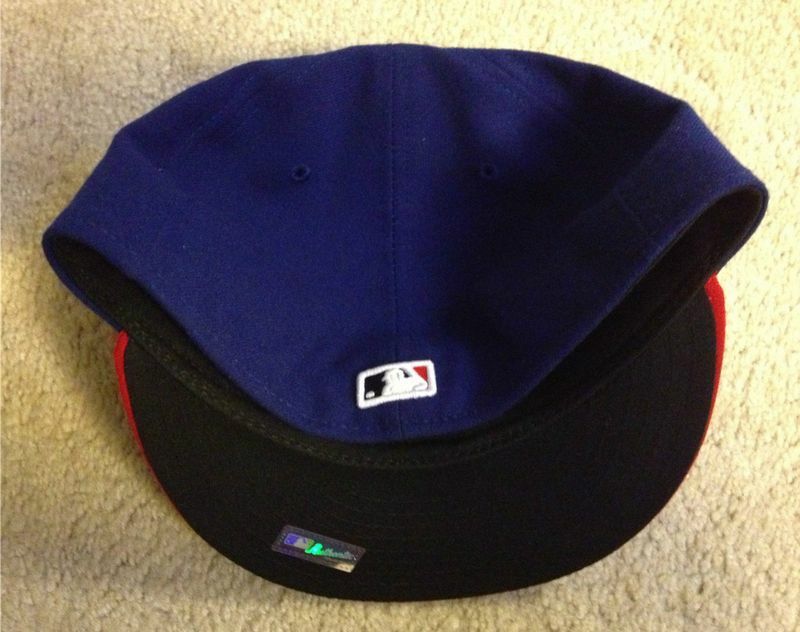 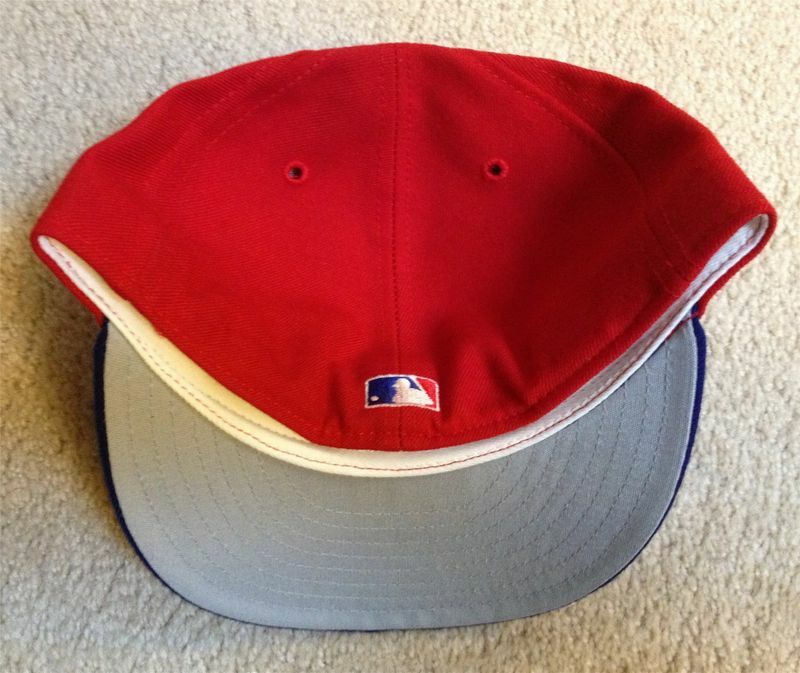 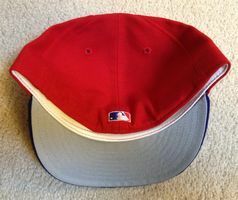 This solid blue cap is used as an alternate only in 1994. 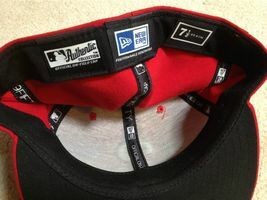 Alternate introduced for interleague games. 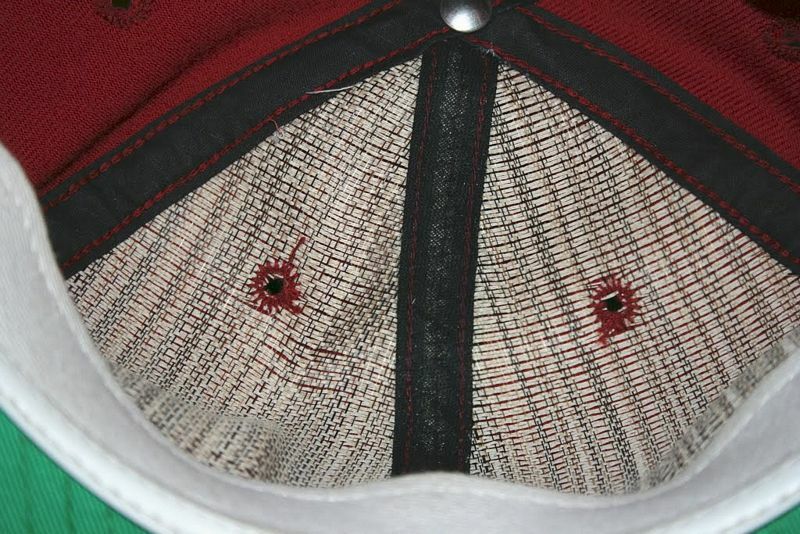 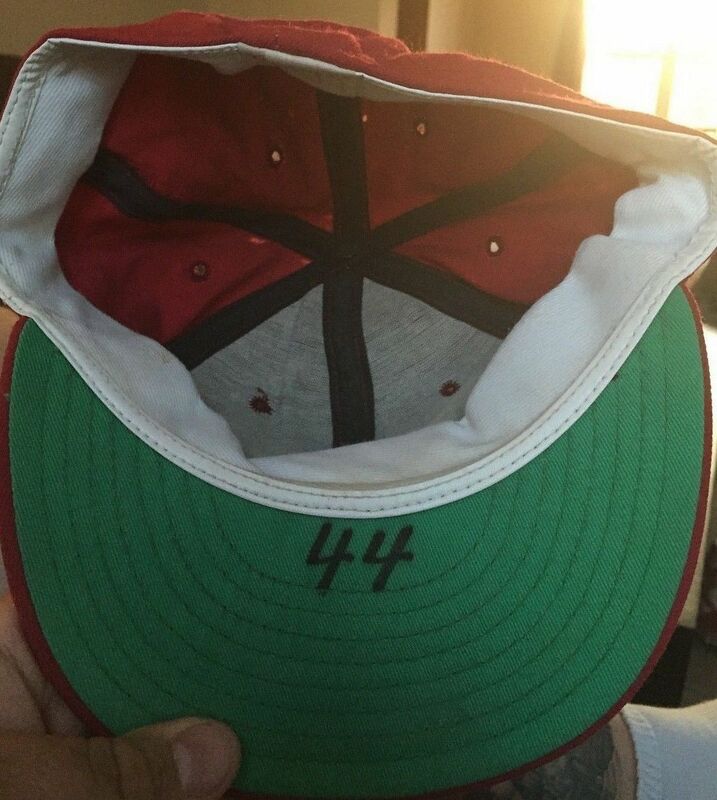 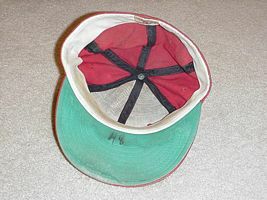 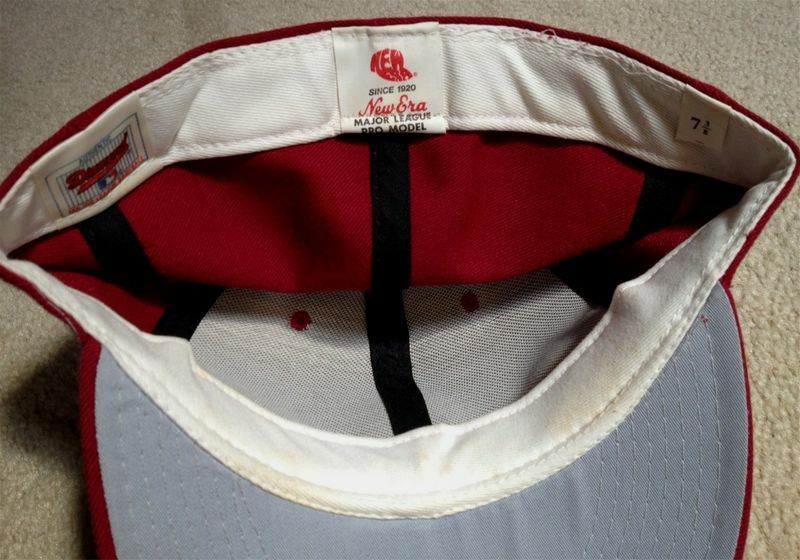 Caps become polyester with black undervisors. 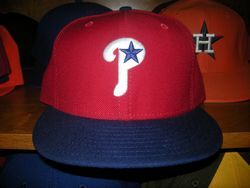 "Interleague" alternate cap dropped; new alternate introduced for use with the new alternate home jersey.